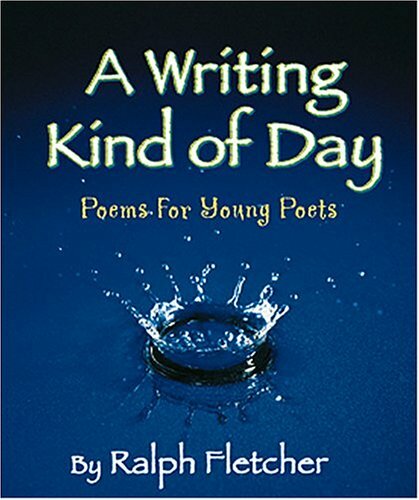 One of the books that I read in my fifth grader’s class was A Writing Kind of Day: Poems for Young Poets, by Ralph Fletcher. Following is my favorite poem from the collection, posted here with permission from the author. you can’t sleep at night. This poem begs to be read aloud, what with all the speeding up and slowing down and loud music and exclamation points. I love the way it defines poetry and its rule-breaking nature with examples in its very structure. The book itself, A Writing Kind of Day: Poems for Young Poets, contains poems about writing poetry. Sometimes a selection will propose an idea  like putting Grandma’s cutting board in a poem  and then the next poem will be about that idea. So in many ways, it’s a book about process, but presented in a fun way. The author has a website as well, if you’re interested in more of his works for kids. Now I may have done the collection a bit of a disservice by following it with my reading of many of the funny poems from Frankenstein Makes a Sandwich. It’s pretty hard to stand up against a poem like “The Phantom of The Opera Can’t Get It’s a Small World Out of His Head,” especially when the cool mom at the front of the class actually sings it. Later, I asked my daughter if she thought the class enjoyed the poetry. She gave the typical tween low-key, “Yeah.” But then she told me that when the teacher announced earlier in the day that I was coming in to read, the class cheered. They cheered! It’s better than money in a paycheck. Thanks. I'll have to look for that one. Sounds good. Congrats on the cheer. That is pretty, uh, awesome or whatever tweens say today. Lucas was bringing Frankenstein Makes a Sandwich to school today to read aloud to his fellow second graders, so we'll see how that goes. He spent most of his morning practicing. He prefers to give a spirited reading. I'd cheer too, MR, if you were coming to read poetry!! Adrienne: I can just see your son giving a "spirited reading."